Kansas Jayhawks College Deluxe Replica Full Size Helmet by Riddell | Sports Memorabilia! 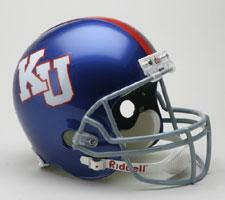 Kansas Jayhawks College Deluxe Replica Full Size Helmet by Riddell. This officially licensed helmet is a replica of what the college players wear. The deluxe replica features an ABS plastic shell, polyvinyl-coated "Z Guard" facemask, a foam padded interior and a snap-on chin strap. These helmets come in official colors & logos.